Dog bite puncture wounds do not look as serious as many other types of dog bite injuries. But don't be fooled. Puncture wounds are often serious, and sometimes even fatal. 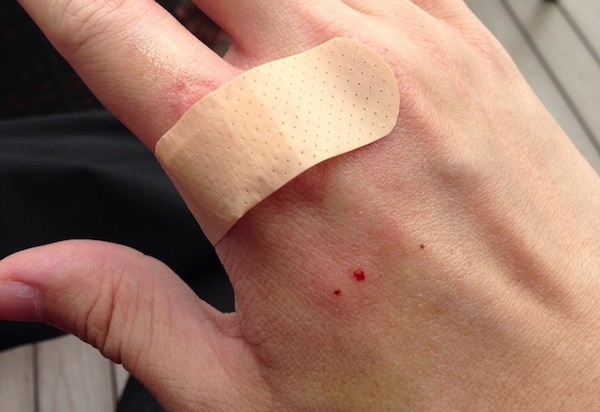 Puncture wounds do not bleed as much as you might expect, and they normally close on their own. For those reasons, many people do not receive proper treatment for the injury, and in the process make things much worse. Victims of a dog bite attack should get immediate medical attention. Prior to closing the puncture wound — with a bandage, stitches, etc. — it’s crucial that you remove as much debris and bacteria as possible. Soap and water works fine in these situations, as well as a normal saline solution. A medical professional can stitch up the wound with sutures (stitches) or staples, which allows for drainage to leave the wound. Do not have a dog bite puncture wound closed with skin glue, such as Dermabond, as the bacteria could become trapped in the wound. There is a concern for infection in dog bite attacks due to the uncleanliness of a dog's mouth. Antibiotics are often prescribed for that reason. However, even with appropriate cleansing, closure, and treatment, the puncture wound can still get infected. It is important to monitor the wound for possible infection. Rabies: This is a virus that spreads to the brain and is almost always fatal. Rabies is transferred from the saliva of an infected dog through a dog bite. Capnocytophaga canimorsus: This is a type of bacteria that lives in a dog’s mouth and can be spread through a bite. Those with weakened immune systems are especially prone. Pasteurella: This is the most common type of bacteria found in infected dog bites. Pasteurella can cause pain, redness, and swelling where the puncture occurred. MRSA: This is a deadly type of bacteria that is resistant to many strains of antibiotics and will not show symptoms in infected animals. Tetanus: This is a toxin caused by certain bacteria that can cause paralysis in those that are not vaccinated. Tetanus is more of a concern if the bite wound is deep. Unfortunately, the above infections and diseases aren’t always caught in time. Some may even be fatal in some cases. Even in cases where the infection is identified in time, amputations may be required to prevent the spread of the disease to vital organs. It can be a terrifying experience to suffer a dog attack that leads to a bite wound. While an incident like this presents many challenges, you do not have to suffer through them alone. At Davis Law Group, P.S., our dedicated dog bite injury attorneys can fight for payment for your injuries so that you can heal with peace of mind. If you or someone you love has suffered a dog bite injury, don’t hesitate to contact our Seattle offices at (206) 727-4000. We offer free case evaluations for accident victims in Washington state. Call us today, fill out the confidential form on this page or use the chat feature below to get started today.